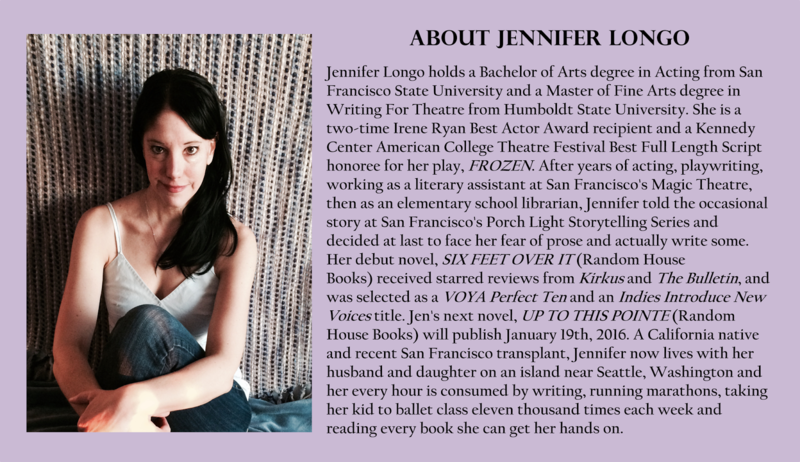 I read Jennifer Longo's debut Six Feet Over It back in 2014 (featured here), and, when I saw that her next book featured a ballet dancer, I knew I had to get my hands on it. You see, I definitely have a thing for ballet books. I'm not a dancer myself, but I was a collegiate athlete and the tough competition between classmates, the grueling athleticism, the injuries, the icing, the inexplicable favoritism, and the drive to get better that takes place behind the stage resonates with me. Harper Scott is a related to Robert Falcon Scott, the Englishman who died in his attempt to reach the South Pole first. Harper's family has always been a little obsessed with Scott and his drive and Antarctica in general. That is why when Harper's plans to dance with the San Francisco Ballet fall apart, she cons her way to McMurdo Station. 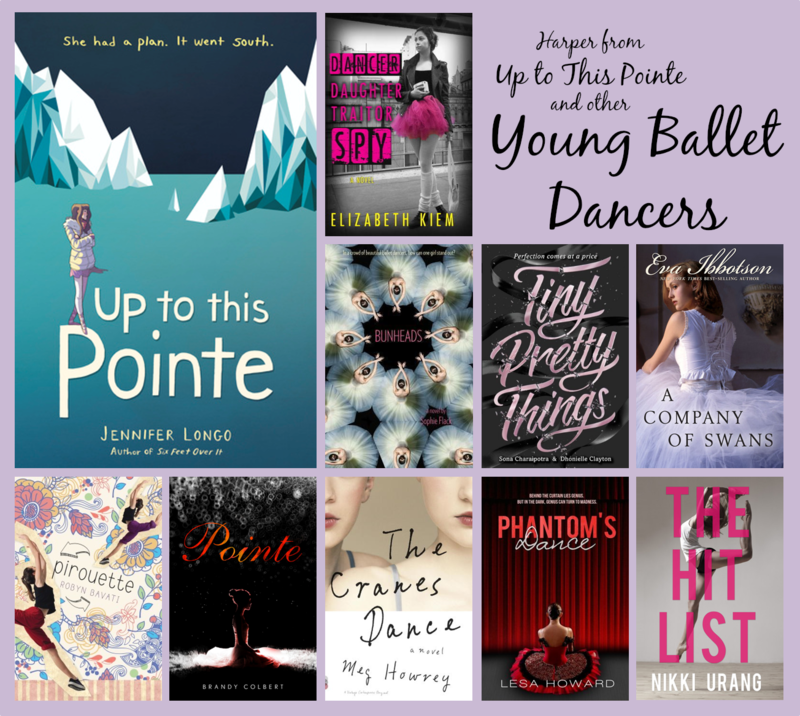 To celebrate Harper's journey and the release of Up to This Pointe on January 19th, we are spotlighting young ballet dancers in literature. Up to This Pointe hits so many of my sweet spots. In addition to the dancing, which I have already mentioned greatly appeals to me, ever since I saw the James Caird while on study aboard in London, I have been so intrigued by Ernest Shackleton, so I loved all the Antarctica bits as well. Furthermore, Jennifer Longo's writing is so extraordinarily lovely. It has this wonderful rocking pace to it that was so smoothing to me. I wish I could have read this book all in one sitting (curse you grown-up responsibilities) because it lulled me in so strongly. Finally, I liked that the story alternated between past and present, San Francisco and McMurdo, ballet and post-ballet; it makes the book more about how Harper deals with this derailment and identity crisis and less about how she got to Antarctica. And I appreciated that distinction. When 17-year-old ballerina Marina Dukovskaya's famous prima ballerina mother is taken by the KGB, Marina and her father must flee to America. This book is full of ballet, the KGB, the Cold War, mobsters, fugitives, international espionage. There are a lot of things to love about this book! Hannah is a dancer with the Manhattan City Ballet. It's a competitive life that is exhilarating, painfully disappointing, and exhausting. Hannah's competitive life calls for absolute commitment. When she meets Jacob, a handsome musician, she starts to question her devotion to ballet. Like, Up to This Point, Bunheads explores how closely who you are is related to what you do. Gigi, Bette, and June are three of the top dancers at an elite New York City ballet school. Gigi is the new, perfect girl. Bette is the displaced queen bee, and June is forever the understudy. This ballet novel is pretty cutthroat! So. Much. Backstabbing. I'm looking forward to the sequel. Set in 1912, Harriet steals away to become a dancer with a company touring to the Amazon. I could gush and gush about this book. It's one of my favorite Ibbotson's. The Amazon setting is so lushly described. The romance between Harriet and Rom is exquisite. And the dancing puts it over the edge. The ballet portions of this book are a bit more on the periphery with this one. Theo is a promising dancer, but her past is about to come back to haunt her in the form of her newly returned best friend, who was abducted when they were thirteen. Fair warning, this book is heavy. Kate Crane is a professional ballet dancer for a company in New York City. Her sister, Gwen, a star of the same company, recently suffered a nervous breakdown and has been packed off to Michigan. Gwen is gone, but she is always present in Kate's mind. And Kate's mind is not serving her well these days. The reader has no idea if things are going to end well or fall completely apart. Christine Dadey is a student at the Rouseau Academy of Dance in Houston with dreams of becoming a professional dancer. Phantom's Dance is a fabulous adaption of The Phantom of the Opera. The dance world lent itself perfectly to the creepy tale. Sadie moved across the country in hopes of reinventing herself after a potentially career-ending injury. Unfortunately everyone already knows who she is. Her struggles to trust herself and a dance partner again are seriously tested by Luke Morrison and the "game" of sexual conquest that has taken the school by storm.